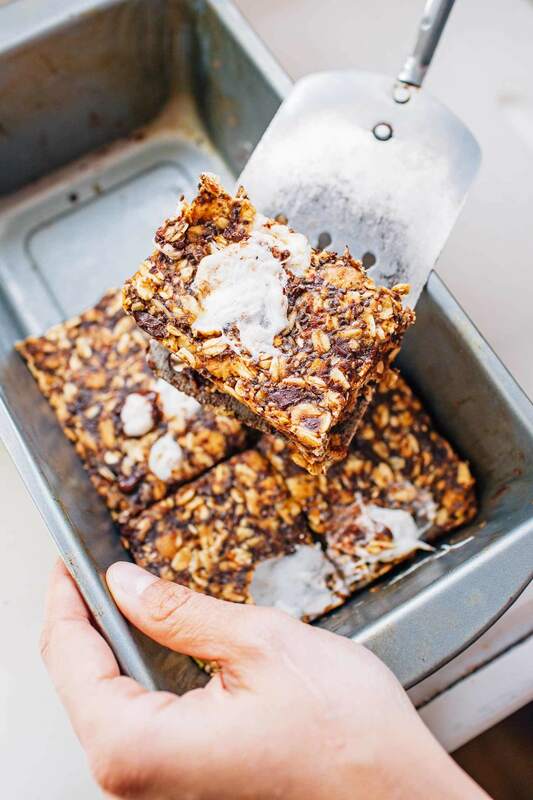 If you’re looking for the perfect portable camping snack this summer, look no further than these vegan S’mores Bars! We had been out exploring northern Arizona when a late spring storm rolled through – and decided to stick around for a week. So rather than sit in a muddy puddle in the desert, we hightailed it over to Durango, CO to see Michael’s little sister. It was raining there too, but at least we were inside of a house. And like always, the moment we had access to a full kitchen with an oven, we immediately started baking. 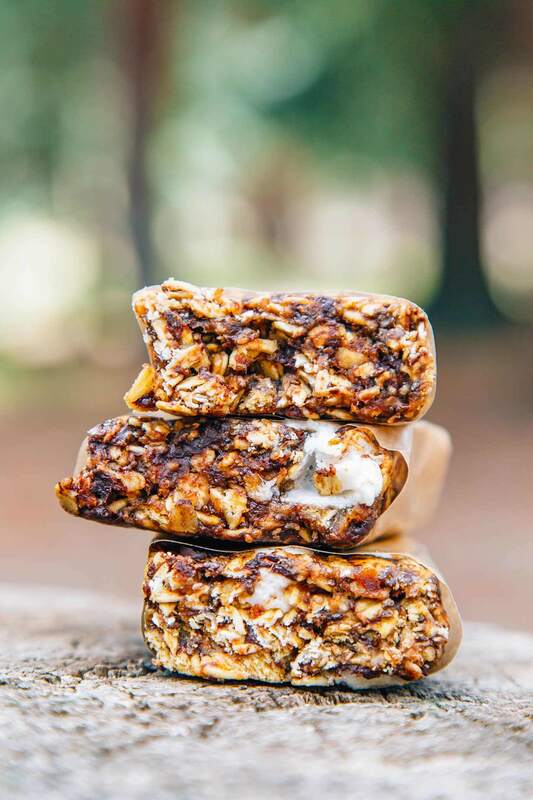 We were looking through our camp kitchen pantry and kicking around ideas for granola bars when we discovered we were still holding on to a package of vegan-friendly Dandies Marshmallows. They were the mini sized marshmallows, which are great for putting in hot chocolate, but could also be used for baking. From there, it was obvious. 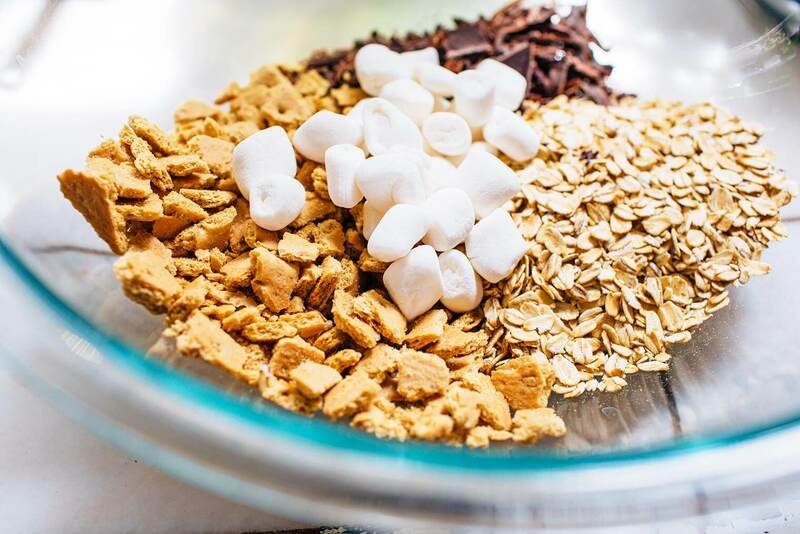 And our minds gravitated towards something we couldn’t believe we hadn’t thought of already: S’mores Granola Bars! Since we were starting with a vegan marshmallow, we figured we could make an effort to keep the recipe vegan the whole way through. Finding vegan dark chocolate wasn’t a problem at all, however, the graham crackers presented an interesting challenge. Nearly all graham crackers are made with honey. But a little research revealed that (while we are sure the homemade variety would be far healthier) Nabisco Original Graham crackers are actually entirely vegan. Just like how Oreo cookies are also inexplicably vegan, we suspect this wasn’t done intentionally but was rather a happy accident. Either way, we’ll take it. 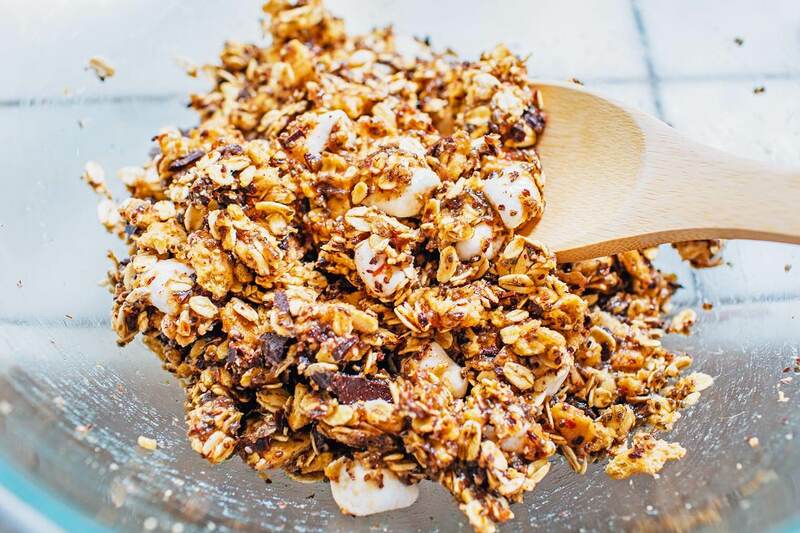 Put all those ingredients together with some toasted oats, add in dates and chia seeds to help bind it all together, and you’ve got yourself a delicious chewy “s’more on-the-go” granola bar. 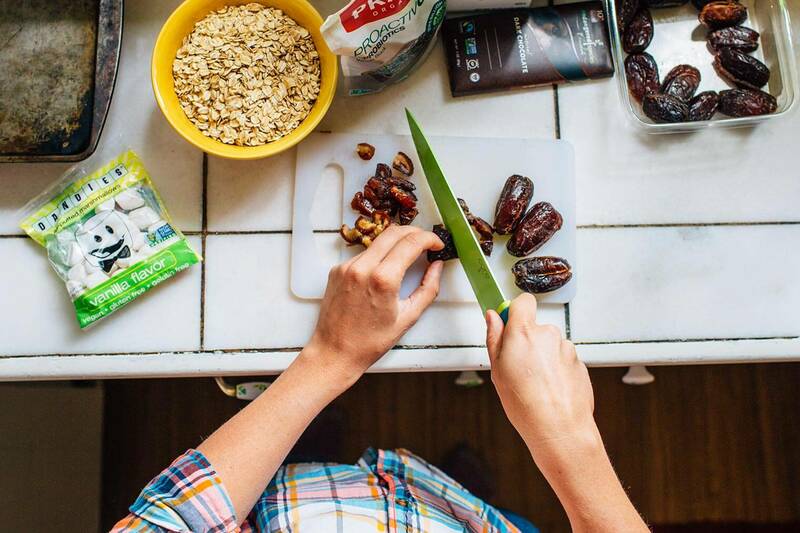 Perfect for your next day hike or for a little camping-inspired snack to get you through the workday. We’ve found Dandies at Whole Foods, well-stocked grocery stores, and on Amazon. We’ve also discovered that the marshmallows at Trader Joes are vegan as well. If you don’t care if these bars are vegan or not, you can easily sub with regular mini-marshmallows and whatever graham crackers you want. 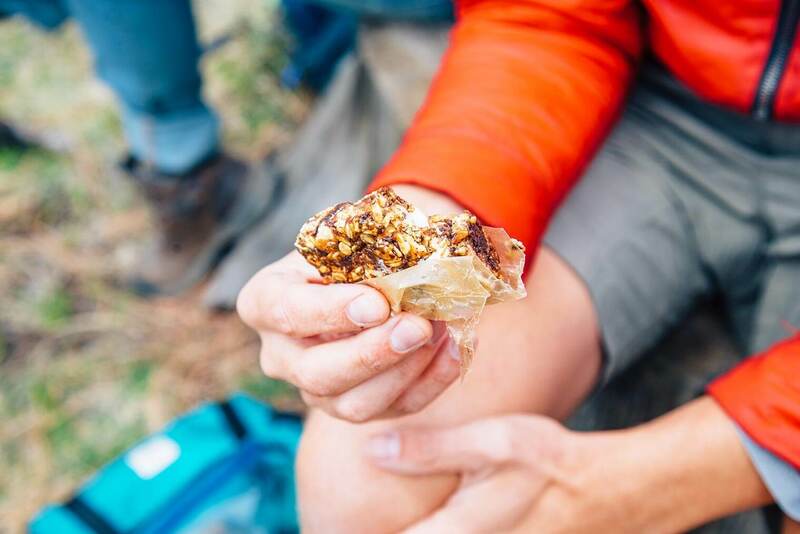 This vegan s'mores bar recipe is a great hiking snack. 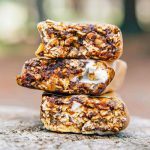 Using vegan marshmallows & graham crackers, dark chocolate, oats, and dates, these granola bars are a high-energy snack that will keep you fueled on (or off!) the trail. 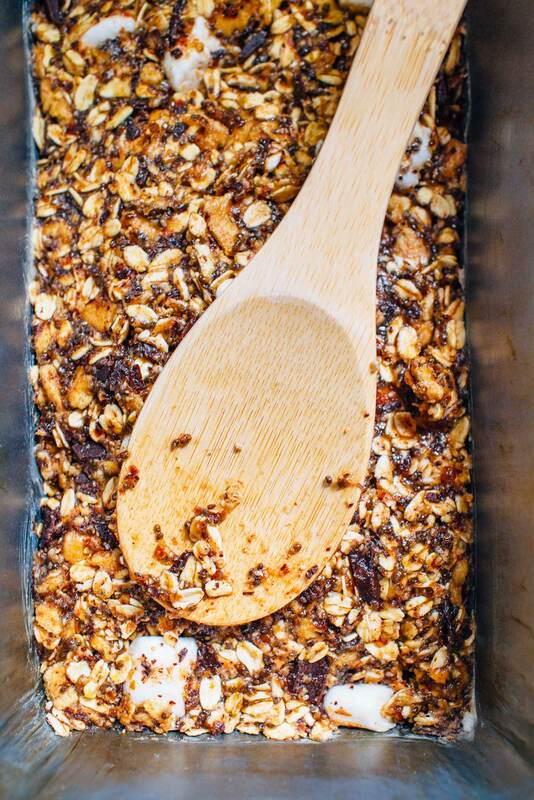 Line a 8.5" x 4.5" loaf pan with parchment paper, or grease the pan with coconut oil or Earth Balance butter. Spread the mixture evenly into the pan, then press down on it to really compact it (I used the bottom of a glass for this). To make these portable, wrap them in parchment paper, plastic wrap, or small ziplocks, then throw them in your pack and go! I made these for a camping trip near Skenonto Lake, NY. I’m vegan and my boyfriend isn’t so it’s hard to find yummy trail snacks that are light for backpacking AND delicious! My boyfriend and I munched on these for fuel while hiking AND had them with coffee in the morning. The chia seeds and oats are full of fiber so we were able to stay full for a little bit before digging into early lunch 🙂 Making these bad boys again today! Thanks! I tried making these a couple weeks ago with sunflower seeds instead of chia seeds due to a reoccurring nightmare about my granola bars growing into bear shaped chia pets and devouring the contents of our bear bag from the inside out. The result was a bland granola bar. Last night I tried them with chia seeds and they were amazing! What a difference one ingredient and a couple of therapy sessions to get over a fear of chia pets can make! I also had better success toasting the oats in the oven instead of in a pan. You speak the true nature of chia. It is the creator and destroyer, binder of delicious treats and phantom of destruction. It is the lightness and the darkness. We all must find out own personal relationship with chia. And we are glad you have found yours. Just so y’all know, marshmallows are he opposite of vegan, they are sugar with gelatin which is made from boiling animal bodies. There are vegan marshmallows out there though. Yes, conventionally produced marshmallows are not vegan (or vegetarian) friendly, but we used + recommend Dandies brand marshmallows for this recipe, which are fully vegan. Trader Joe’s also carries a vegan-friendly marshmallow. How long do they last out of the fridge? Thinking about making them in advance for Burning Man! So we haven’t tested this, but we assume they should last for a least a couple of days. We’d recommend keeping them in a cooler, if possible, or at least in a sealed container kept out of the sun. Good luck out there! Those look sooo good ! I’m going camping with friends this weekend in Algonquin Park, Ontario, to celebrate Canada Day, we’ll definitely make those ! And i Iove how you always list the required equipment … it makes it even easier, thanks ! Hi Audrey! Hope you had a great camping trip & enjoyed the bars! Algonquin looks SO beautiful. We hope to visit the park ourselves one day! Oh heck yeah!!! Not sure how you managed to hang onto those marshmallows for that long – but kudos :p I’m thinking these will be an awesome “darn – I’m still at my desk..” snack at 3 pm haha. Definitely putting these in my lunch next week! These are perfect! I love anything with graham crackers! This looks delicious. I love S’mores in any form. Thanks for the recipe! 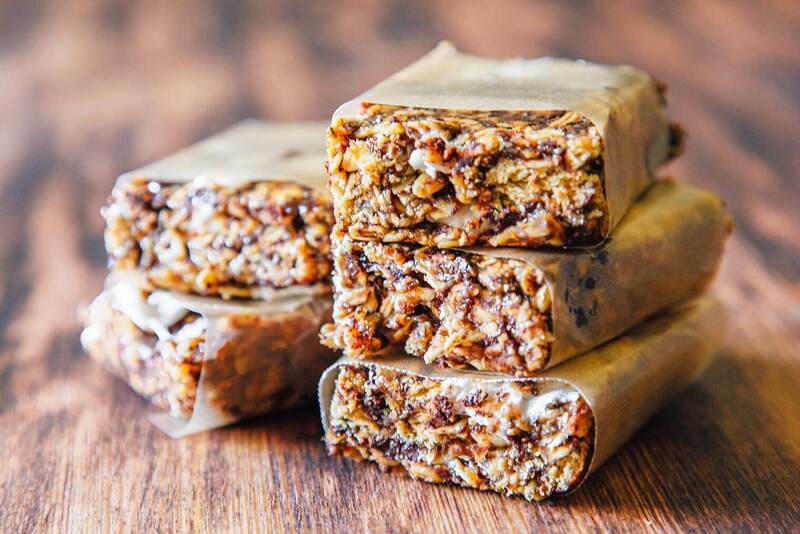 Man oh man, these granola bars are perfection! I LOVE the smores flavoring! Ok. Yum. These look amazing and I can hardly believe they’re vegan! Nice!